We’ve always been big Doberman fans, and there’s just something so…handsome about these loyal, slender, muscular dogs. With their energetic characters, these dogs can often be found alongside policemen and soldiers as faithful working companions. And because they love, love, love to get active, they need top-notch food to keep up their energy! What’s The Best Food For Doberman Puppies? My dog gets a little gassy when he eats his food. What’s going on? I think my Doberman has a chicken intolerance. What are my options? Do you ever wonder whether your Doberman should be eating a specific type of food? And what does that mean for your unique, beloved puppy? Is a ‘regular’ puppy food what you’re after? 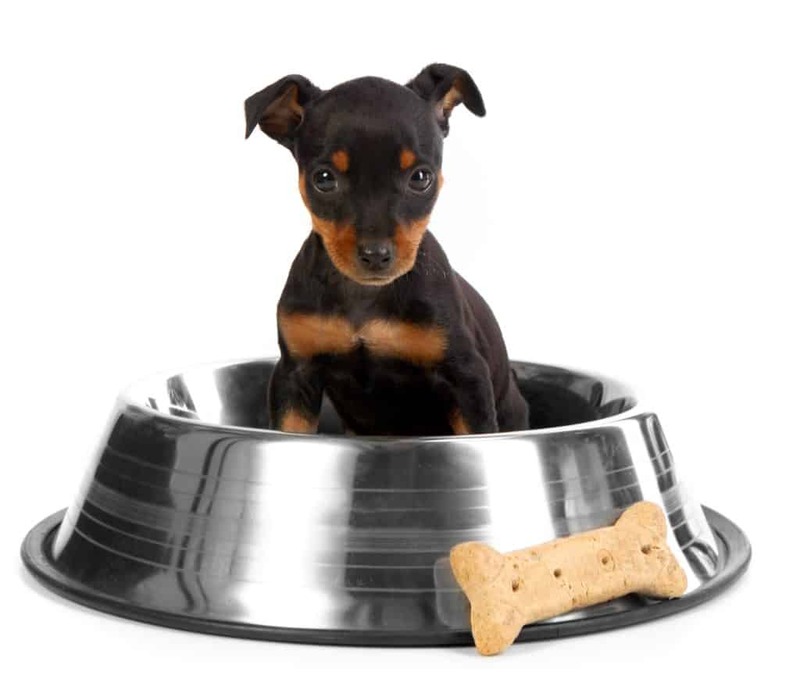 We’re going to answer all these questions for you in this one article, before reviewing our top three Doberman dog foods for puppies and adults. The more active your Doberman puppy (or grown-up), the more calories he’ll need. A good daily caloric range for adults is between 1050k/Cal daily for a smaller, slightly active female, and 2500k/Cal each day for an active male Doberman. Puppies will need more than this, and because this figure will vary depending on their age and activity level, it’s best to head over to our dog food calorie calculator to have a check. 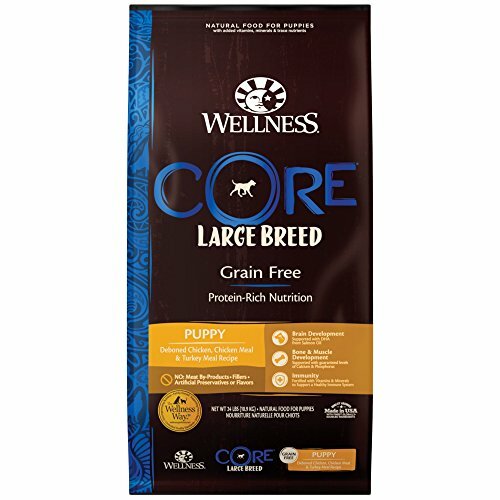 However much exercise your little pup’s getting, either way, he’s going to do best on a large breed dog food — these contain all the required nutrients which we’ll look at next. Large dogs, in general, have specific requirements that we, as owners, have a duty to bear in mind! For our best friend’s health, therefore, let’s touch on these now and see what’s important. For puppies, vets tend to recommend more than 25% protein per serving — they’ll be using this to grow, as well as maintain, new muscles. Adults, on the other hand, will get by just fine with slightly less protein, although it’s good practice not to choose something with less than 22% protein for regular, healthy dogs. In all dog foods, protein can come from a combination of both meat- and non-meat sources. For this reason, you’ll find that some of the best dog food for Doberman puppies (and grown-ups) contains ingredients such as lentils, peas, egg, or similar. 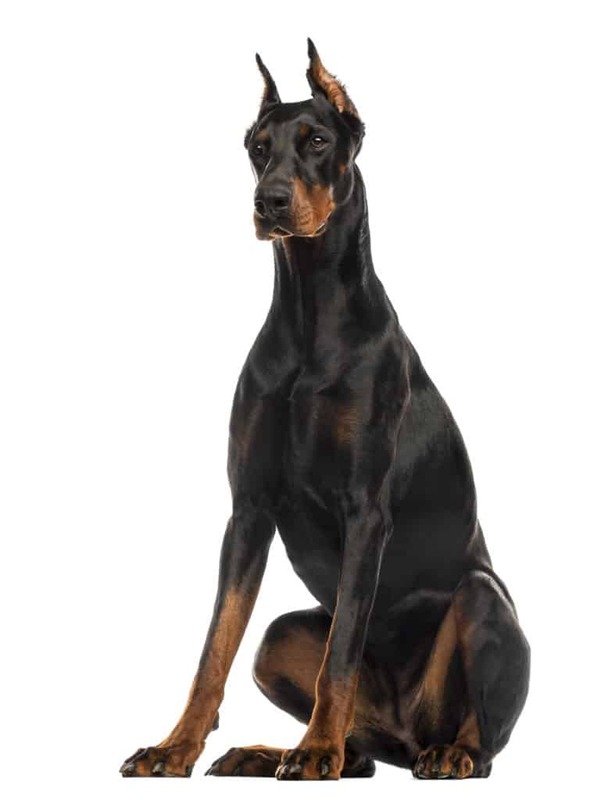 Don’t be alarmed if you notice a slightly higher fat figure (15% or upward) on your Doberman puppy food. If you’ve only got an adult Doberman, you may be used to seeing figures in the 12-13% range. Both these figures respectively represent healthy averages for larger dog breeds, and that includes your Doberman. What you will need to look out for is whether you can associate that fat with a real animal. For example — we all know where chicken fat comes from, or pork fat. ‘Lard’ or ‘animal fat’ is somewhat less desirable, so avoid Doberman dog foods that list strange ingredients in this vein. Minerals and vitamins can sometimes take up a lot of room on that ingredient list, and it can sometimes seem like they all go by different names that are hard to recognize. Don’t get alarmed — especially if you’re a first-time dog owner — stick with AAFCO-approved dog food and you’ll find that all the required minerals and vitamins are already included. That goes for all the Doberman dog foods we have reviewed here. C, K, D, and A vitamins all contribute to healthy functioning for your dog and will be found every one of the best dog food for Doberman puppies. In terms of minerals, calcium is the most likely to be featured on the ‘Guaranteed Analysis’ list. Ensure your puppy is getting sufficient calcium (1.2% or more), as this is critical for him to grow strong and resilient bones. Here are some picks that meet the requirements we’ve just laid out, and in all cases, they’re AAFCO-approved! Beef, lamb, and pork — three kinds of healthy meat — can be found in this gluten-free puppy dinner by Fromm. Salmon oil’s the natural source for your puppy’s glucosamine needs. Contains lentils, as an extra awesome non-meat protein source! Dogs who can’t eat potato will, unfortunately, have to check out our limited ingredient dog food reviews…well, their owners will, at least! A healthy and zero-grain option with good amounts of growth-friendly protein. Plus, this features multiple different protein sources, which is a big tick if you’re hoping to avoid overexposing him to any one ingredient. 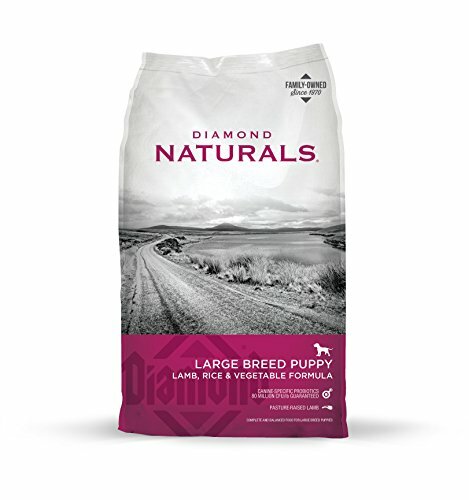 Lamb, rice, and lovely veggies will make this Diamond Naturals formula a novel choice for most Doberman pups. If you’re tired of buying dog food that’s chicken-flavored, your pup may be just as tired of eating it, so here’s a nice change! 2% calcium for those developing teeth and bones. There’s little for us to complain about with this blend! This formula contains antioxidants to increase your Doberman’s immune-defense systems, as well as Omega-rich salmon oil. It also features kale, pumpkin, chia seeds, and quinoa, in all their nutritious goodness. Neither grains nor gluten to be found in this bag of turkey and chicken dinner! Your Doberman pup will get a whopping 35% protein, to boot — plenty of those important building blocks for his muscle development. It’s made only using natural preserving, flavoring, and coloring agents. USA-made, featuring chondroitin, glucosamine, broccoli, spinach, and apples. That’s a lot of goodness in one mea — we like it. Five stars! Dobermans are typically considered ‘mature’ once they reach twelve months of age. This may be earlier or later for your dog, but when he or she is an adult, one of these Doberman foods may be a good option to switch over to. 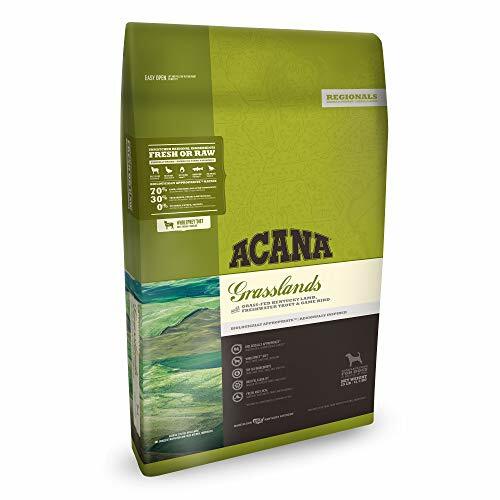 In one 25 pound bag of this Acana kibble, you’ll find 17.5 pounds of dried, raw, or fresh prey ingredients. That means free-run tasty duck, Kentucky lamb, and trout, too. Features DHA, because grown dogs can benefit from it, too! Due to the super-high-quality meat content, you’ll find this is priced much higher than most of the other brands we have reviewed. Suitable for all sizes, Regionals dinner is some of the best dog food for Dobermans. All the protein your grown dog will need to maintain his slender frame and vivacious energy levels! 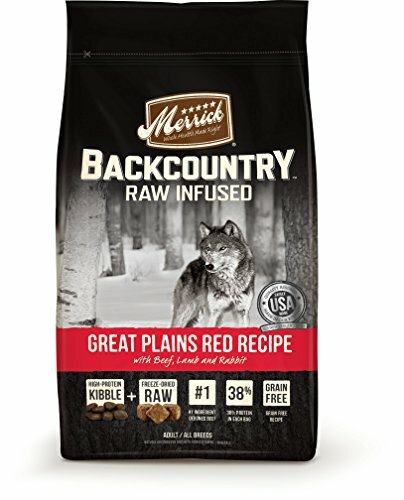 Merrick Backcountry Grain Free Raw Infused Great Plains Red Meat Dry Dog Food, 22 Lbs. Rabbit, lamb, and beef make a 38%, protein-packed kibble that also features freeze-dried ‘bits’ of raw food. Entirely grain-free and designed for maximum taste, your faithful sidekick will love this Doberman dog food! There’s both chondroitin for protecting large-breed joints, and it’s partner glucosamine. This may be a little expensive if you’re on a budget, but that’s only because there are so many great, healthy ingredients in this formula. 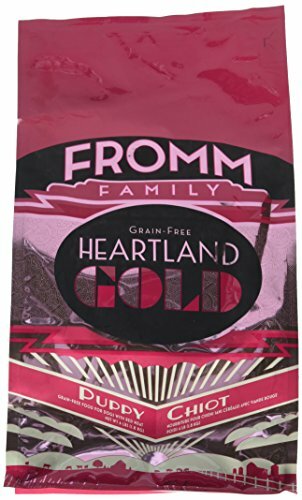 If you’re after maximum deliciousness for your dog, that’s what the flash-frozen bits in this Doberman food are designed for. Also, it helps to maintain the nutrients in their best possible form for your pet to absorb. Nice, right? 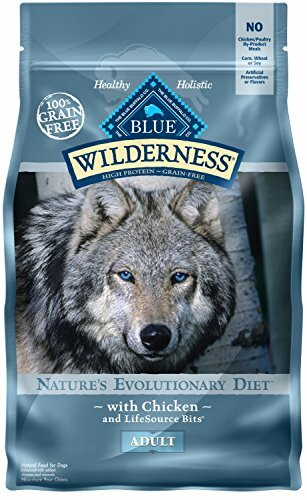 It’s so hard to go wrong when you choose Blue Buffalo — but to mix things up a bit, why not try this ‘Nature’s Evolutionary’ formula for your Doberman? You’ll also see that there are fiber-rich sweet potatoes, parsley, and kelp in this Doberman dog food, too! Not really, with so many fantastic reviews, we’re loving this wholesome recipe. We didn’t even have enough space in the ‘Pros’ section to mention that this formula contains glucosamine…and healthy calcium levels, and that it’s also grain-free. All the good things — five stars! Is he ‘gulping’ his food? Sometimes, our sweet large-breeds can get a little too enthusiastic, and may swallow excess air. It’s not something to be too alarmed about, but you might want to think about changing to a kibble that discourages this behavior. Head over to our ‘Best Food for Large Breeds’ page, where you’ll find a huge range of different options — you’re sure to find a good solution! Has he switched to a new food? If your Doberman has just started eating a different brand, he may be unused to it. Try to ‘transition’ your dog when you switch foods, and you can look at our Dog Tips page for more help on this! Has he experienced this gassiness while eating other Doberman foods? If not, you might want to think about changing his diet to a different food. If this is an ongoing situation, it’s always best to consult a vet. Good that you’ve been observing your Doberman so responsibly. You have a lot of options right here at your fingertips, actually! If you would like to browse some Hypoallergenic Dog Foods, we have reviewed a huge selection on this site. If you think it may be more of a sensitive stomach issue, visit our Best Dog Foods for Sensitive Stomachs page. You may also want to visit his vet, who can tell you what might be occurring with more certainty. But whatever you do, remember that even a 100% chicken-free blend isn’t going to cut it if he’s sneaking (or being fed) little bits from elsewhere, so keep a sharp eye out — and best of luck! 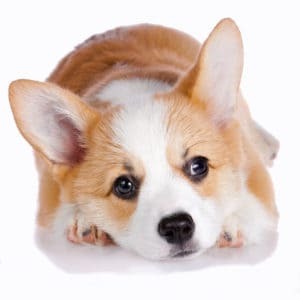 What’s The Best Dog Food For Corgis? 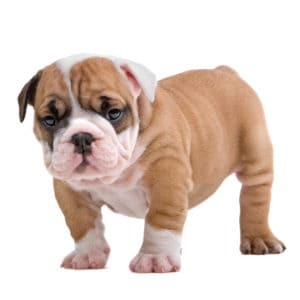 What’s The Best Food For English Bulldogs?